There are no liquor stores in Chilmark, West Tisbury, Vineyard Haven, or Aquinnah though all except Chilmark now allow the sale of beer and wine with meals in their restaurants. Chilmark is now the only truly ‘dry’ town on the Island. If you are dining there you are welcome to BYOB – bring your own alcoholic beverage. Restaurants may be licensed to serve alcoholic beverages, though some are limited to beer and wine. Chilmark restaurants may charge you a setup fee for mixed drinks or a corkage fee for wine service. Many regard the BYOB option as a bonus because it assures that they will be able to enjoy their favorite wine with dinner. In Edgartown and Oak Bluffs ‘package stores’ and some markets such as Tony’s in Oak Bluffs, carry a full inventory of beers, wines and liquors. Save time and energy by stocking up at package stores while visiting/passing through Oak Bluffs and Edgartown. Or, centrally located near the MV Airport, is MV Wine & Spirits. When making dining reservations, it’s always a good idea check to see what beverages are available to be served. Many Island farms are actively organic and Community Sustained Agriculture is enthusiastically supported. You can learn more about Island farms and the CSA movement by visiting The FARM Institute and viewing our guide to Island farms . In the summer, farm stands dot the roadside. 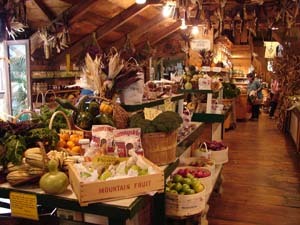 Some, such as the ever popular Morning Glory Farm in Edgartown, not only offer a wide variety of fruits and vegetables but prepared foods from their farm kitchens as well. Island-made condiments, preserves and pickles, cheeses from around the world, Island-made artisanal breads, Portuguese products, fresh herbs and, of course, seafood of every description are just a few of the extraordinary foods that are routinely available. Savor your shopping and be surprised at what you find. MVOL favorite: Granola, baked goods and soups from Little Rock Farm. 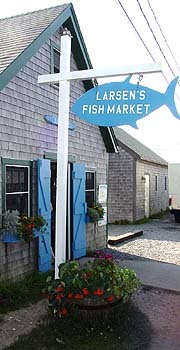 For the convenience of boaters, general stores (and in Oak Bluffs and Edgartown, liquor stores) are located in close proximity to the harbors.For those who need to stock up for more than an overnight sail, Stop & Shop is located just a short stroll from the Vineyard Haven harbor. The same is true in Oak Bluffs where Reliable Market on Circuit Ave. is just steps away. 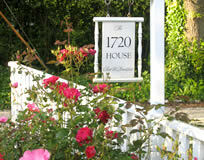 In Edgartown, a convenient in town bus will take you to the large Stop & Shop, just minutes away from downtown.